The first sign of very slight fever in an infant can send parents scurrying to the doctor’s clinic. There are a number of things parents should be familiar with, when dealing with toddler fevers. A fever in a toddler is simply not uncommon. The problem with parents, especially new parents, is that overreaction is the norm. Your little one certainly is delicate, but is more resilient than you think. 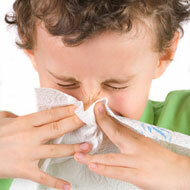 Fevers, headaches and other ailments are part of life and your child has to learn to battle them early on. A toddler with a fever will have a temperature roughly over 100.4 degrees F. Keep in mind that if the little one is actively scampering around the place his or her temperature is bound to be higher and it doesn't. What Causes Toddler Fever And Vomit? What Causes Toddler Heat Rash?